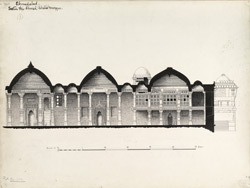 Section illustration of Ahmad Shah's mosque in Ahmadabad, Gujarat from James Burgess' 'Original Drawings [of] Muhammadan Architecture of Ahmadabad.' Sultan Ahmad Shah (r.1411-42) founded the city of Ahmadabad in 1411 and was responsible for the construction of several buildings and mosques. His Ahmad Shah mosque, also known as the Chhoti Jumna Mosque, was built in Ahmadabad's citadel and completed in 1414. An Arabic inscription over the central mihrab records that the mosque was built by Ahmad Shah in 1414. The ground plan of the Ahmad Shah mosque is based on the Jami Masjid in Cambay, built in 1325. The roof is covered with ten large domes and other smaller ones between. Key features of this mosque include the eight perforated stone windows which light the interior and the use of pillars, which originated from an earlier Hindu temple, to support the domes which demonstrate the fusion of Islamic and Hindu architectural styles.